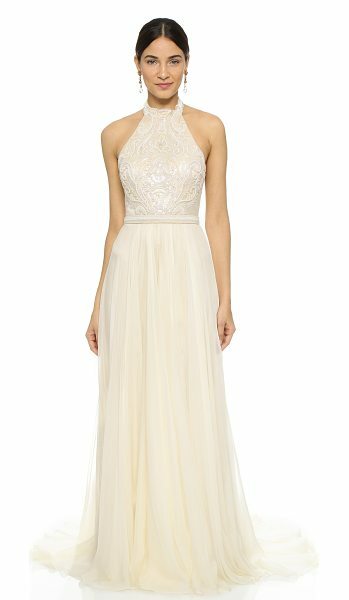 Intricate, tonal beading accents the mesh bodice of this ethereal Catherine Deane gown. The ruched skirt is made from airy layers of silk chiffon. Boning structures the sides, and buttons close the halter neckline. Hidden back zip. Fully lined. Fabric: Beaded mesh / silk chiffon. Shell: 80% polyamide/20% rayon. Skirt: 100% silk. Lining: 100% silk. Dry clean. Imported, China. Measurements Length: 63.5in / 161cm, from shoulder Measurements from size 4.